Anyone check out Sheila Bair over at the FDIC tonight? Assuring the world that your money, in banks is safe? Says who? They feel so confident in their position, you can't even comment on the video! If the public yanked their money, from any of the major NY banks, and put it in their neighborhood credit union, the public could take any of these banks down. After all, what are these banks doing with your money? They're not lending it. 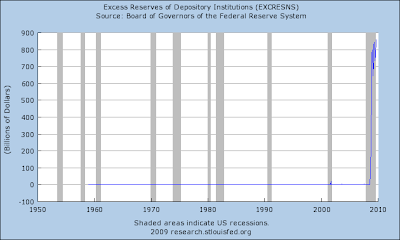 They now have, for the first time ever, over $1.034 trillion of excess reserves at the Fed. Why aren't the banks lending? Isn't that what they promised? Maybe because the banks really know what is on their books! So Sheila Bair says the banks are safe. And Wells Fargo says their books aren't cooked. Maybe every depositor at every major bank should see how true that really is! And while they are at it, they should sell their American Express now that it has tripled and dump Capital One now that it has quadrupled since Meredith Whitney warned us about the coming credit card contraction on March 9. And when do you imagine you will have a good view of a run rate going forward and what will be the catalyst that will trigger a more pronounced investment in marketing? Her beef is that AXP and COF aggressively cut back on their advertising budgets; and pocketed this money in earnings. COF did it to the tune of $130 million dollars. Somehow she missed that in her models! But take COF off the table, and blow out AXP while you are at it. Meredith Whitney is asking about a marketing budget. At the bottom, she was destroying these stocks in her research. Now that they have had a massive move, she is asking about marketing. She blew the bottom, so maybe she'll blow them up here. Use Meredith Whitney as a contrary indicator to press the sell button on those names! Here she was on the today show in September, telling the world that home prices were going to fall another 25%, and warn us about credit cards again. Watch Diane Sawyer fawn all over her. And now, she's asking about the credit card's marketing budget? In any event, you now have the antidote for Sheila Bair. Just trying to keep things fair and balanced!